If your computer is likely to crash downloading and viewing these large PDFs, then have a look at a selection of the viewpoints below. We have taken screenshots and uploaded some of the key viewpoints into a gallery. We haven’t chosen all the viewpoints: several of those in the Glenmount submission show trees and shrubs, and surprise surprise! – you can’t seen the wind farm from behind a bush! But as you will see below, you can see it from all over Ayrshire and beyond, and you can see clearly that it will destroy some of our most beautiful countryside. We agree with the East and South Ayrshire Landscape Wind Capacity Studies, which say clearly that planners should “Maintain the rugged scenery and sense of wildness associated with Loch Doon and the Carrick Hills by directing wind farm development away from this landscape and ensuring that development sited in surrounding landscapes avoid significant impact on its setting and experiential qualities.” The same studies also say that there is “no scope for larger development typologies to be sited in this landscape” and that “no turbines over 20 metres should be considered for this landscape.” How clear does the advice have to be? Glenmount – Its time to object! Just as we were dusting ourselves down, recovering from the horror that was Linfairn Windfarm, Keirs Hill sneaked in with a festive treat for us to digest over Christmas. The timing didn’t deter our supporters who managed rustle up another 3000 objections (without having to bribe locals with electricity discounts, or pay people to canvas strangers in the streets of Ayr)! Now, as expected, Glenmount (RWE Npower) have come in with their Section 36 application, clearly desperate to cash in on the feeding frenzy before policy changes make the process less lucrative for them. Time is extremely tight for this application, and we only have until 24th February 2014 **STOP PRESS: the DEADLINE IS EXTENDED to 10th March** to submit representations to the ECDU. SSfS have therefore prepared a how to object page to try to simplify the process for those who wish to make a considered objection. The planning documents are not available online yet, although they are in the McCandlish Hall in Straiton and should soon be available on the East Ayrshire Council planning website. STOP PRESS: click here to see the key documents and key images. The non technical summary is available on the RWE website. The summary however shows that very little has actually changed from the original scoping documents (the turbines have reduced from 22 to 19). Some highlights which RWE point out are below and might just give you an indication of how they view the area they intend industrialising. There is plenty more information within these documents, clearly designed to shock locals and tourists alike. Notable of course is yet another developer making a determined effort to ignore the SNH commissioned East and South Ayrshire Wind Capacity Studies (2013) which explicitly state (yet again) that the site area cannot accommodate any large scale turbines. If you are as horrified as us by this proposal please Object Now. SSfS will prepare a more detailed submission however please, as always, send us any additional comments or concerns you may have and we will ensure they get included. Bill Steven, Chair of Save Straiton for Scotland, delivered another devastating blow for the developers circling Straiton and the surrounding villages. RES UK have received a major rejection for their shocking 149m high turbines at Keirs Hill, over 3,000 objections were delivered to the Energy Consents Unit in Glasgow as Save Straiton for Scotland and our friends at Craigengillan combined our efforts to highlight the ludicrous 149m high turbine application from RES. Bill Steven said “this is a total rejection from the people of Ayrshire who are horrified by this wind farm application. We have to stop this total destruction of our Ayrshire landscape and developers have to take responsibility and stop submitting such damaging, outrageous, mis-placed applications that totally ignore local communities and Scottish planning guidelines. At a recent public meeting in Straiton the audience were truly taken aback by the size and scale of the Keirs Hill application. People asked “How on earth can a developer show any concern for individual homes and communities when they think 149m high turbines so close to homes is acceptable? Save Straiton for Scotland would echo this. The turbines are too high, too close and too many. 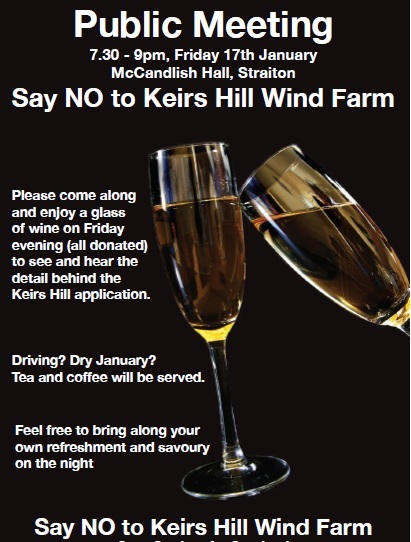 We are delighted that over 3,000 people agreed and took the time to object to Keirs Hill wind farm. Now that the festivities are out the way for another year, SSfS wanted to have an opportunity to get everyone together for a wee glass of wine (or a cup of tea or coffee!) and a catchup to discuss the latest proposal at Keirs Hill. With less than 2 weeks to go until the objection deadline, this is the last chance to ask any questions, pick up some additional postcards for friends and family, and reflect on the true horror of what is being proposed just over the hill. We look forward to seeing as many of you there as possible!